With more than 30 years of service, our professionals have been involved in more than 1,000 solid waste management projects for private clients as well as municipalities, local and state governments, regional authorities, and national governmental agencies. Design, permitting, construction, repair/maintenance, and decommissioning/closure of transfer stations, materials recovery facilities (MRFs), composting facilities, and landfills. Unique among our peer firms, Geosyntec provides both technical professionals and financial advisory specialists who offer a wealth of experience evaluating solid waste systems and infrastructure assets under a variety of project delivery and contracting mechanisms. Our private and public clients are increasingly driven to improve performance, secure value for money, achieve required returns, and optimize use of assets. To assist their understanding of market drivers and operational issues, our advisory specialists translate technical and commercial issues into financial analyses, valuations, and support for financial models, with clear recommendations made without bias or allegiance to any vendor, service, or product. Geosyntec’s exceptional advisory capabilities are made possible by our practice leaders’ unique understanding of the symbiotic relationship between the technical aspects and the financial performance of solid waste projects. The technical and financial expertise of our practitioners allows Geosyntec to be a trusted advisory resource for counties, municipalities, states, and solid waste authorities. Geosyntec offers deep experience and knowledge of solid waste planning in accordance with state and local goals for waste diversion and recycling while considering dynamic market conditions. Our expertise is built on a legacy of being recognized leaders in helping our clients implement environmental solutions in a safe, efficient, and cost-effective manner. We are emerging as national leaders in sustainable materials management, specializing in identifying strategies to accomplish financial and environmental goals established with stakeholders and preparing action plans to detail how the strategy will be implemented. These plans serve to identify and quantify materials that could be diverted for recycling or serve as feedstock for recovery and conversion facilities. Once a strategy has been identified and agreed, we develop tools and training materials to educate managers and stakeholders about the strategy. We also develop performance metrics to measure the success of new strategies and identify where improvements can be made. Geosyntec assists its clients in developing their operations to meet cost, waste reduction, and long-term community goals. For many clients, we have provided analysis and guidance in planning and designing the administrative structure for the effective management of solid waste systems. This includes organizational analysis; developing performance measures to gauge efficiency of programs and services; evaluating the administration of personnel, physical, and financial resources; and benchmarking. We make certain that new or modified planning strategies and objectives are appropriate, financially sound, and viable. We provide operation evaluations to determine the effectiveness, efficiency, and safety of services provided by contract operators. We identify causes of performance shortfalls, offer proven recommendations to reduce costs and improve productivity and services, and assist with monitoring program results. As part of these efforts, we have prepared organizational audits, conducted regulatory compliance assessments, provided cost estimations for operation, maintenance, and equipment replacement, designed management information systems, and assisted in organizational planning and selection of personnel to fill key positions. We have identified the organizational strategy and then planned the structure of resources needed to implement effective system management to achieve the goals of the organization. Our efforts have resulted in improved allocation of resources, expanded and more-reliable services, enhanced worker training and safety, reduced customer complaints, and lower costs. Our professionals understand that fully-integrated solid waste management and recycling services are highly complex operations that involve coordinated and sometimes competing interests involving trucking, heavy equipment, construction, maintenance, finance, and personnel management. We understand the advantages and disadvantages of the various types and sizes of equipment, as well as the multiple options available for operating and maintaining equipment. We offer real-world forensic and operating experience from dozens of materials recovery facilities (MRFs) and waste handling facilities, with first-hand knowledge of the common pitfalls affecting solid waste management facilities and their operations. Conversely, we have also worked closely with dozens of clients that operate efficient and well-managed solid waste operations, and so recognize the standards for good practice. We understand the limitations of engineering and where close operational, financial, and management control is essential for a system to perform well. Geosyntec’s professionals have evaluated and designed numerous solid waste transfer stations for our clients. This work has required us to evaluate sites, provide layouts, perform environmental assessment studies, prepare permit applications, and construction documents. Geosyntec projects have included: (i) retrofit design for an existing 3,000 ton/day transfer station in Annapolis Junction, Maryland to incorporate automated material recovery equipment and design; and (ii) permitting, including county and Virginia Department of Transportation (VDOT) permits for a citizen’s drop off facility in King George County, Virginia. Geosyntec also has extensive experience in providing construction management (CM) and construction quality assurance (CQA) services for transfer stations and civil infrastructure including resident project representative services and minimizing and managing dispute resolution on behalf of our clients. Additionally, Geosyntec staff have more than 30 years of experience in the design, technical and operational aspects of the solid waste management industry. Our transfer station improvement experience includes identifying design and operational failures in poorly performing transfer station facilities, reviewing repair alternatives, preparing work scope and budget, and evaluating post-repair success. In cases of substandard operating procedures, we can identify equipment and training deficiencies and prepare operating plans to address environmental compliance or safety hazards. Geosyntec has extensive experience performing wasteshed analyses of integrated waste management and recycling systems that allow us to identify where materials are going, how they are being managed, and what the market rates are for services. We have designed waste-sorting protocols and conducted waste characterization studies for specific processing technologies to recover recyclables and organics for composting. We have experience helping our clients understand the highly variable revenue streams that can come from recyclable commodity sales and have expertise at identifying and valuing alternative revenue sources including tax credits, renewable fuels credits, commodity revenue sharing, franchise royalties, and asset valuations to maximize financial benefits. Waste services can involve a remarkable number of specialized contracts, including host agreements, franchise agreements, long-term maintenance contracts, and capital projects contracting. Geosyntec’s professionals have deep experience in negotiating and managing contracts. We help client organizations understand the current contractual commitments they must work within as well as how to potentially restructure future contracts in a manner that reduces risk and improves performance. Geosyntec assists in negotiation of contract and indemnification language and evaluates the merits of available contracting alternatives for projects such as guaranteed fixed-price versus lump sum and others. Geosyntec has significant experience designing wasteshed analyses and conducting waste characterization studies for specific processing technologies which recover recyclables and organics. Geosyntec professionals are familiar with the specific challenges posed by waste separation and processing, particularly as the industry moves toward automation of these operations. Our experience is based on actual facility design and facility operating requirements. We have directly managed and performed dozens of waste composition and characteristics studies, both to evaluate the bulk waste stream and to determine properties of specific waste streams of interest for separation and processing, supporting our clients’ assessment of the feasibility of emerging technologies. Geosyntec is regularly engaged to provide valuation services for solid waste assets and has provided financial analysis for long-term and annual budgeting of integrated waste management systems, cost-of-service estimates, and closure and post- closure reserves. We have performed valuation studies and cost-benefit analyses for internal and third-party collection, diversion, and disposal alternatives. Geosyntec performs the full range of consulting services for solid waste programs, including rate studies, financial assurance cost estimates, escrow account analysis, and tipping fee analysis. 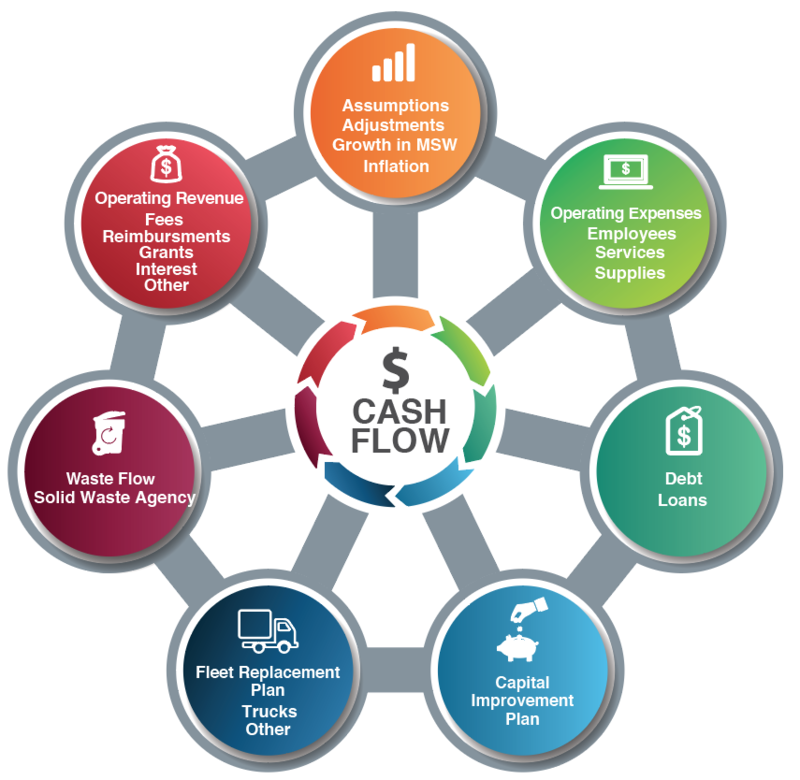 Our staff has the ability to offer an independent evaluation of solid waste rates and charges that will allow solid waste agencies to meet its financial obligations, capital funding needs for system expansion, renewal and replacements, and to set aside appropriate reserve fund balances. Our financial consulting experts have assisted more than 100 clients in the development of solutions resulting in financial stability. We have made formal and information presentations to county commissions, city councils, authority boards, and citizen’s advisory boards to gain acceptance of proposed new or revised rate and financial recommendations. In the course of this analysis, we have also routinely developed a number of computer models capable of evaluating the economics of current practices in comparison with alternatives. These Pro Forma Models account for the number and density of collection locations; vehicle capacities and compaction cycle times; time per stop; off-route time; fleet size; crew size; labor costs; and comparison of the costs of in-community disposal versus long-haul transport and disposal outside the community. For a wide variety of solid waste clients, Geosyntec’s solid waste advisory team has led benchmarking surveys of solid waste collection, landfill operations, and transfer station and MRF operations. These assignments have included developing metrics on staffing numbers, equipment usage, and various financial metrics. The aim of these studies was to benchmark operations with well-run operations of a similar size to those of the client to determine relative efficiency and operations for operational improvements. We also offer unrivaled expertise in objectively reviewing, analyzing, and measuring operational outcomes and key performance indicators, then comparing them to industry benchmarks via data and customizable models our consultants have developed over the course of their careers. Geosyntec recognizes the importance of stakeholder engagement in highly visible planning projects conducted by organizations charged with protecting the public good. While traditionally a provider of technical engineering and scientific services, we also know the value stakeholder outreach and engagement services bring and have learned from experience that mutually beneficial outcomes are best obtained when communications professionals work alongside technical experts to engage the public and other stakeholders. Our in-house team of communications specialists offer extensive experience developing engaging content via a wide variety of media. We also have experience developing websites, software applications, and other digital products, all of which helps our clients identify and reach the right audiences with the right messages to deliver meaningful interactive experiences. Our graphic designers are communicators first who believe that design is useless if it is not grounded in a clear understanding of audience, purpose, and message. Geosyntec also provides operational-level support services, often through specialist sub-consultants. These services include facility management and technical assistance, engineering and specialized part sourcing, and performance optimization and combustion control.